Although the GUTGAA blogfest is primarily about pitching or getting ready to pitch to find an agent, this week the fest has opened up for comments from writers looking for either critique partners and/or beta readers. I have taken the opportunity to add my own requests for both of them, on the relevant blogs. Thanks to those who have volunteered below. I will be in touch over the next two weeks to start this off, whilst seeing also what the GUTGAA blogfest might or might not bring. Any further volunteers for a beta read, please continue to comment below also. I’ve been inspired today, so am busy ploughing back through my revision tasks, and am almost complete on the fourth/fifth revision. The novel is basically ready to go to both a critique partner in a chapter by chapter format, to beta readers in the next few weeks, and also for me to start to seriously locate a professional editor. (Perhaps that’s the wrong way round? I don’t know, that’s something a critique partner might be able to set me right on). 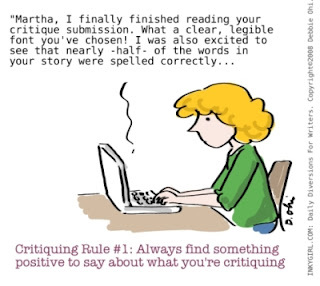 A critique partner is typically a fellow writer who is giving you an objective opinion and generally focuses more on improving the craft of your writing as well as editing and clarity. Note that I have a kind offer from one fellow thriller writer to provide a look over of my manuscript, but have also signed up on the comments for the GUTGAA matchup, hoping to find one or two long-term partners. Finding another writer who gets the genre, and also my antipodean and somewhat sarcastic at times sense of humour, is a real ask. And I’m definately after somebody who wants that long-term relationship, and understands the crime / suspense / thriller genre. On the GUTGAA matchup, by far the most comments are from writers doing fantasy or YA, as usual. As much as I enjoy reading NA or YA, the audience and genre I write in requires something different. Hunter Emkay, writing from Sydney Australia. However, my novel is set in the U.K. I am writing suspense / psychological thrillers. I have work ready to be submitted to a critique partner or group, by chapter. I am currently working through the fourth revision of that novel, with WIPs just starting on others. I would prefer a very small group of one – four critique partners in the same genre. My Australian timing means that I may be available at different times to others in the group, but I’m not after group activities, just advice from anyone with the time and a good grip of the genre. I’m looking for a long term partnership with a person(s) with good sense of humour, and somebody who cares for my work and progress as much as I will theirs. I am okay with any timings on submissions and feedback. I would prefer something a little more regularly than monthly – bi-weekly or weekly, with flexibility to fit individual workloads etc. 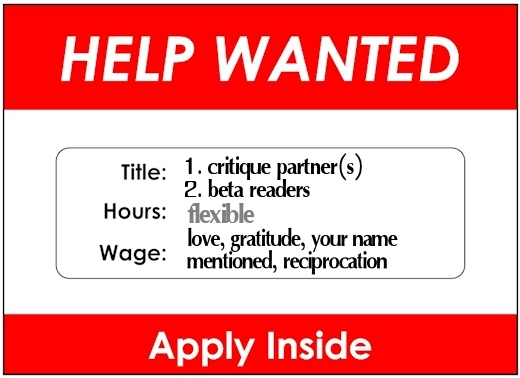 I would like to work on chapter(s) – a couple, but again, can be flexible in that. Honest feedback wanted. And the ability to accept my own. I’m after suggestions, thoughts, impressions, ideas, and yes – even line editing if and when it’s needed. The Beta Reader signup for GUTGAA is found on Ellie Heller’s blog post here. If you are after a position as a beta reader, no matter what genre, then please go and signup there where general beta readers are encouraged. 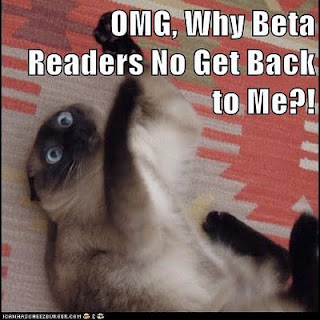 At the moment, the comments are full of writers like me signing up for betas, but no actual readers. My first beta reader will be, naturally, my husband. I will be looking for a general – “does this work or not?” response from him, and any early betas I might find. However, I am primarily after long-term betas who want to help me out in getting both Blue Daisies and in the future, the series, ready to ship. Beta Readers will be sent Blue Daisies in full ebook form – I can provide it for Kindle apps, or iBooks apps, or in PDF form if needed. As this will be my first time at sending out and receiving from betas, I will wing it with some flexibility, but may later provide a list of general questions I might like betas to think about when reading the book. If you specifically would like to beta read for Blue Daisies please contact me via email or the comments section below. Again, I want to emphasise that I would like to find betas who are interested or love the genres I write in – suspense / crime / psychological thrillers, and have an understanding of what is needed in those genres to make a good read. I’m very excited for you that Blue Daisies is at the point where you’re getting ready for critique partners and beta readers! Congratulations! I would be ecstatic to be a beta reader for your novel. While not well-read in the thriller genre, with the popular exceptions of Stephen King and Dean Koontz, I love the emotional turmoil and fast-paced action of these types of novels. While I am quite busy, I will make myself available to a thorough reading of your work in a short turnover period. Let me know if you’d like my help. Either way, good luck with the process! Hey Hunter, I am more than happy to beta read / critique your work for you, you can contact me, initially on kjmnsn(at)gmail(dot)com. Thanks for your wishes, Mia. Thank you Mike, Karen and of course, J.C. I’ll take you all up on your kind offers, and see what the signups at the GUTGAA blogfest may bring also. Naturally, you have now sent me into the heebie jeebies about actually “doing this thing” and going public with my work, lol. I will be in touch with each of you over the next two weeks – I’ve given myself that time to finish up the last revision, and clean up the copy.